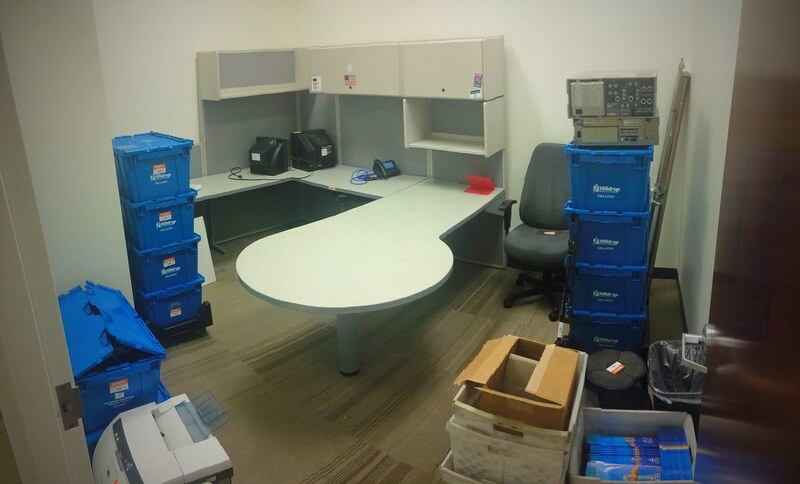 A chronicle of packing my old office in Winter Park that I occupied for 12½ years (more than half of my nearly 22 years in this building) and setting up in my new space at the Altamonte Springs building. 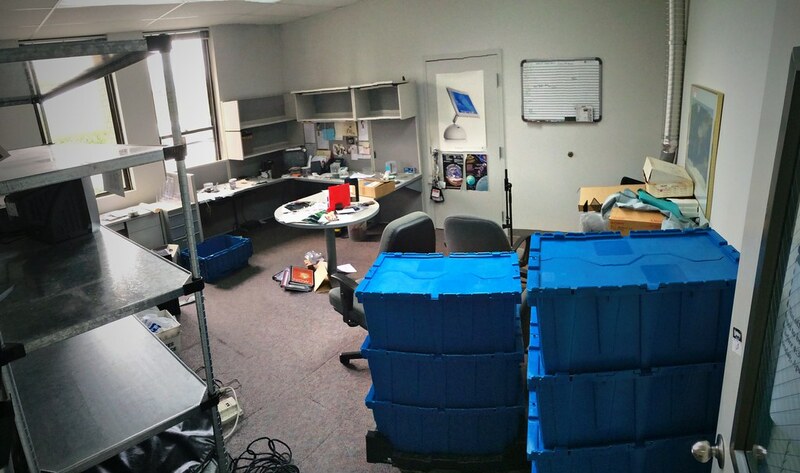 After I had finished at the old office, I had about a week off of work while movers took all my bins to the new office. This is what awaited me when I came to work for the first time in Altamonte Springs on April 21. It's finally coming together and feeling like an office instead of a dumping ground! Thanks to a pair of IKEA Kallax (formerly Expedit) shelves, and HUGE thanks to coworker Aric for assistance in picking them up and assembling them, things are finally off the floor, and I've recovered a substantial portion of desk space. The AV equipment on the back of the desk will be cleaned up and set up for media duplication this week. The moving company will be here on Thursday to hang pictures. I have two art pieces visible on either side of the photo plus a clock out of frame to the left. Both tube televisions will be going away. The black one on the floor used to be for video editing, but we're doing HD stuff on nice LCD screens, making a tube studio monitor obsolete. The gray TV on the back desk was for monitoring video copies and tuning cable TV, but everything is going digital and this TV is only analog. I intend to get an LCD display and mount it on the wall above the printer. The rear and side portions of my desk are still in progress for unpacking and cleaning up, but I've cleaned everything off the visitor/meeting portion of the desk, and my art and clock are now up on the walls. Tomorrow morning, a new LCD television/monitor will go up on the wall behind me. Everything is clean and put away. Successfully secured a flat screen TV monitor for the wall and got rid of both clunky old tube monitors. 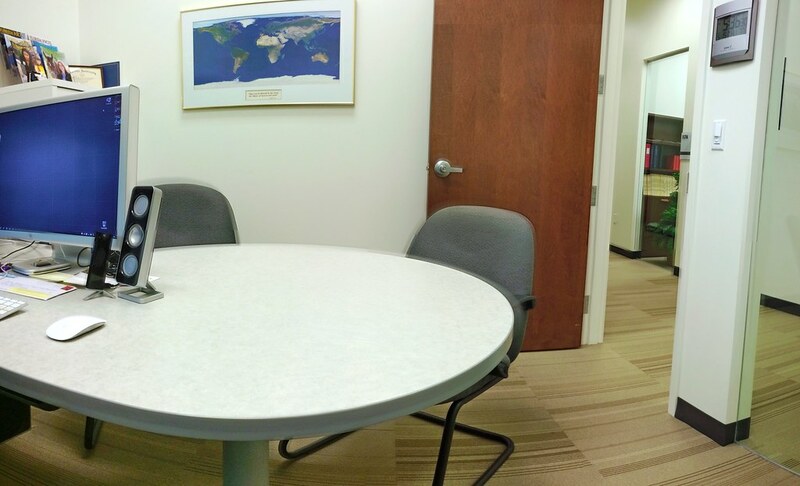 I am making it my credo, unlike the past 22 years of my employment, to keep my office in this presentable manner. I invite you to visit me any time to make sure I'm keeping my promise. 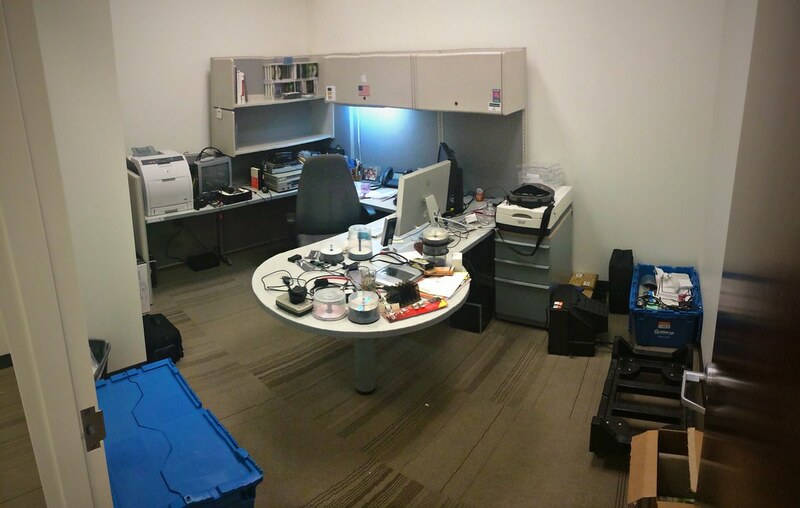 Do note, this panorama makes my office look a LOT larger than it really is. Yes, it's small, but it's exactly the size I need. How small? Well, you see the open door on the right side of the picture? When closed, it matches up with the doorframe just barely visible in the lower left corner next to the light switch/sensor. Looks like one final step in finalizing my office—the lighting. Normal office fluorescent bulbs are FAR too warm of color temperature, and having six bulbs in my small office felt almost as bright as being outside. So I finally managed to remove all those yellowish-light bulbs and install just a single D50 bulb on the far side of my office. It's just the right amount of light without glaring directly above me on my computer screen. It's funny, when people see it for the first time, they think it's a blue-tinted light. But when you sit under daylight color temperature for a few minutes, you realize it's closer to actual white. In fact, you can see the spilloff from the warmer color light in the hallway over on the right side of my desk, on the far wall, and on the floor. 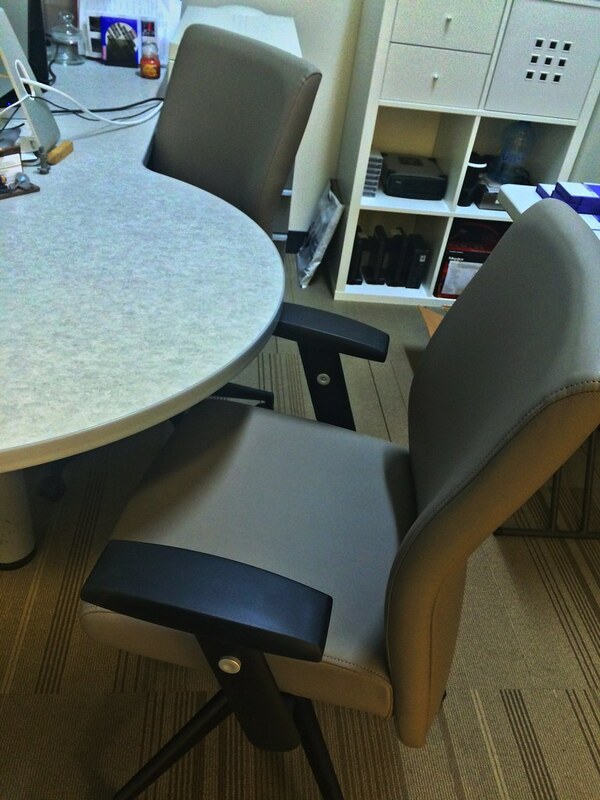 Fortunately, though, it doesn't really reach as far as where I sit. 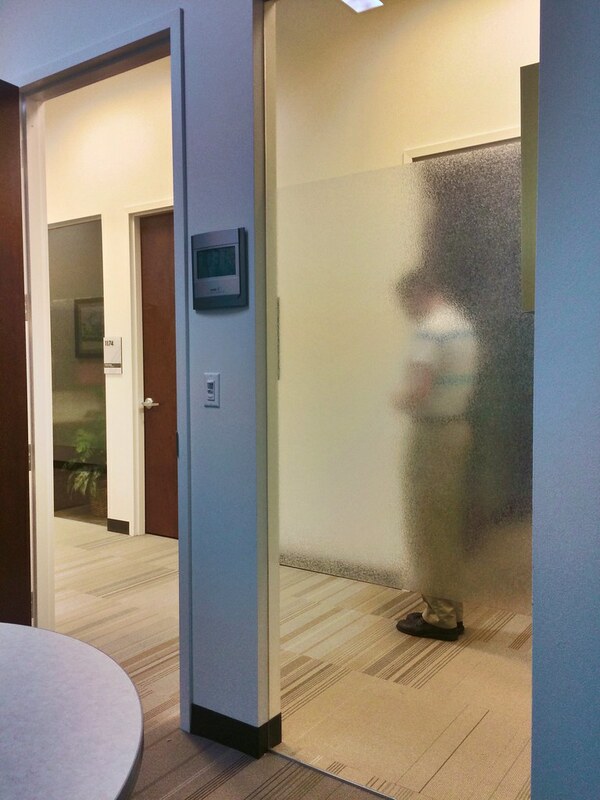 Hooray—privacy film on our offices at last! 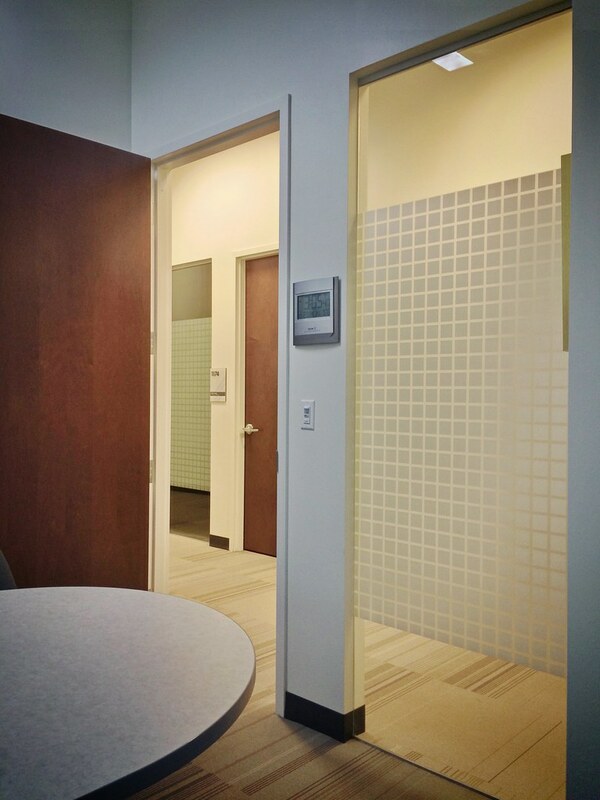 I guess enough people in the office disliked the previous privacy film which felt like it belonged on a bathroom shower panel. I like this new stuff.